TOKYO (Reuters) - Japan said on Tuesday it had lodged a complaint with Seoul and demanded an apology after a South Korean lawmaker said the Japanese emperor should apologize over the issue of “comfort women” who were used in military brothels. Relations between Japan and South Korea, both U.S. allies, have soured because of an intensifying row over their wartime history. That includes Japan’s 1910-45 occupation of the Korean peninsula and its use of “comfort women”, Japan’s euphemism for women, many of them Korean, forced to work in its wartime brothels. 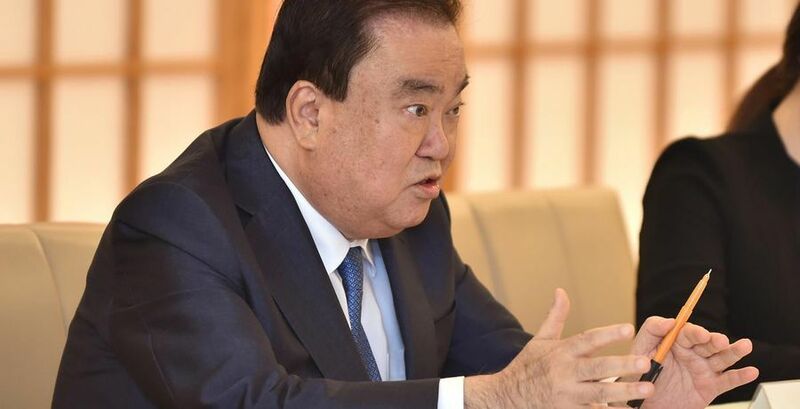 South Korea’s National Assembly Speaker Moon Hee-sang said in an interview with Bloomberg last week Japanese Emperor Akihito, “as the son of the main culprit of war crimes”, should apologize to women forced to work in Japan’s military brothels before he steps down at the end of April. That would be a sign that Tokyo wanted to end the prolonged dispute, Moon said. Japan’s Chief Cabinet Secretary Yoshihide Suga told a news conference in Tokyo on Tuesday that Moon’s comments were “extremely regrettable”. “We strongly protested as his remarks have absolutely inappropriate content and are extremely regrettable,” Suga said. “At the same time, we demanded an apology and withdrawal of his remarks,” he said. Relations between the two East Asia neighbors have also deteriorated since South Korea’s top court ruled last year in favor of South Koreans seeking compensation from Japanese firms for wartime forced labor. South Korea also complained after a Japanese patrol aircraft made what Seoul described as an “intimidating” pass over one of its warships last month, adding to the tension between the two.